So you have a new pet. Congratulations! We wish you and your fur baby a long and happy life together. To get you started on that life lets make sure that you have done everything you need to do to make sure that your new dog or cat, puppy or kitten, get the right start. Pet license – Albuquerque requires that you have a pet license, we can take care of that for you in our Los Lunas and Albuquerque Vet-Co clinics. Microchipping – If your fur baby ever gets lost, a microchip will make it much easier for them to be returned to you safe and sound. 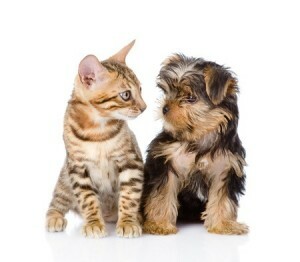 Spay and Neuter – Not all puppies and kittens come already spayed or neutered. You can get them fixed as young as 2 months. Declaw – This is best to do when they are young and can be paired with their spay/neuter. Flea and Tick treatment/prevention – It is a good idea to treat every new pet for flea and ticks as well as get them started on their semi-annual Frontline Flea and Tick prevention treatment. Supplies – food, food bowl, water bowl, litter, toys, leash, collar, catnip, fur ball remedy, soft paws, water dish, dog bed, crate, treats. We have more great resources on owning a new puppy or kitten.